Use a product that is usually only available to professional growers! 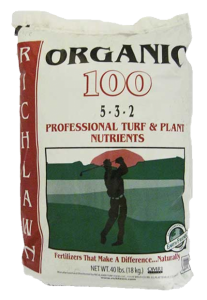 Richlawn 5-3-2 fertilizer is a 100% organic product. It is listed by OMRI for organic use. This means that the product has been tested and verified 100% organic by an independent third-party organization. By applying Richlawn 5-3-2 you can achieve professional results, by using a product that the experts use. Primary Nutrients Derived From: Dried Poultry Manure. * 4.60% Slowly Available Nitrogen from Poultry Manure. 1.00 lb. N/1000 sq. ft. 871.20 lbs./acre 20.0 lbs./1000 sq.ft. 0.50 lb. N/1000 sq. ft. 435.60 lbs./acre 10.0 lbs./1000 sq. ft.